Finally, it’s release day for Gypsy’s Lady! What do you do when a USA Today bestselling author asks you to entertain the idea of having your two motorcycle club worlds overlap? You say yes, idgit. That’s what they call a no brainer. And that’s what I did back in 2016 when the lovely Author Lila Rose​, author of the Hawks MC book series, suggested we blend our worlds for her book, Living Without. While entirely her work in terms of storyline, character involvement, and of course every aspect of her Hawks characters, when published, the book contained several scenes where my writing introduced the RWMC characters of Mason and Gypsy. It was fabulous fun working with her, and I cannot thank her enough for the experience. Then, I had even more for which to thank her, because she gifted me a character to bring back to my world. Sweet, damaged Kelsey had evolved into my Gypsy’s love interest, and I couldn’t wait to see where their narrative took us. 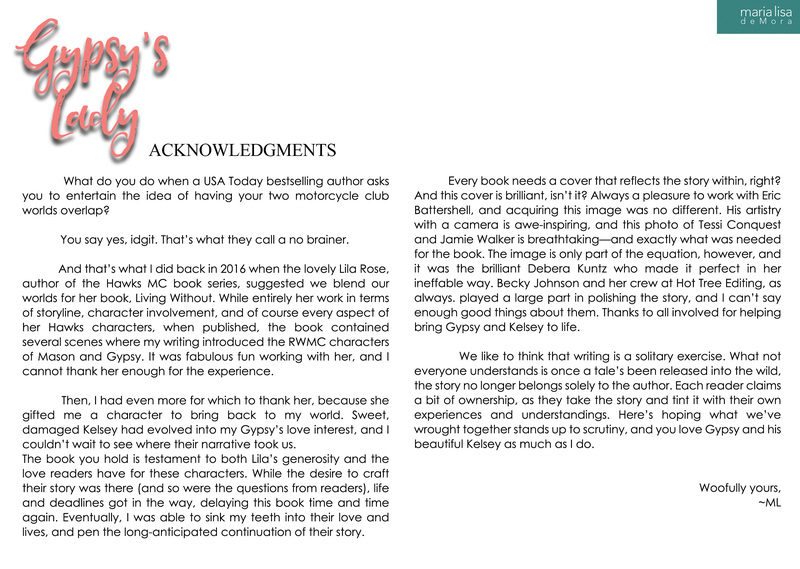 The book you hold is testament to both Lila’s generosity and the love readers have for these characters. While the desire to craft their story was there (and so were the questions from readers), life and deadlines got in the way, delaying this book time and time again. Eventually, I was able to sink my teeth into their love and lives, and pen the long-anticipated continuation of their story. Every book needs a cover that reflects the story within, right? And this cover is brilliant, isn’t it? Always a pleasure to work with Eric Battershell Photography​, and acquiring this image was no different. His artistry with a camera is awe-inspiring, and the photo of Tessi Conquest​ and Jamie Walker​ is breathtaking—and exactly what was needed for the book. The image is only part of the equation, however, and it was the brilliant Debera Kuntz​ who made it perfect in her ineffable way. Becky Johnson​ and her crew at Hot Tree Editing​, as always. played a large part in polishing the story, and I can’t say enough good things about them. Thanks to all involved for helping bring Gypsy and Kelsey to life. We like to think that writing is a solitary exercise. What not everyone understands is once a tale’s been released into the wild, the story no longer belongs solely to the author. Each reader claims a bit of ownership, as they take the story and tint it with their own experiences and understandings. Here’s hoping what we’ve wrought together stands up to scrutiny, and you love Gypsy and his beautiful Kelsey as much as I do. Gypsy had lost faith in his fellow man and was drifting through life when he found the Rebel Wayfarers MC. Having forever been a stranger to love, he was stunned when it beckoned to him from a darkened room in faraway Oz. The route to hold the woman of his dreams might be turbulent, but now that he’s found her, he’s determined to keep her…no matter the cost.